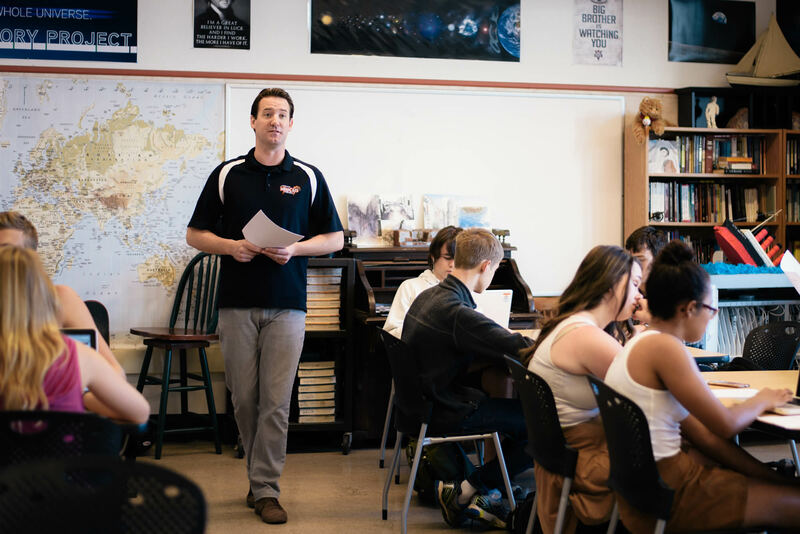 Big History teacher Damian Pawlowski in his classroom at Los Gatos High School. Photo © Amal Bisharat. In the BHP course, students are presented with, and asked to make sense of, a lot of very big ideas. In the process, they’re doing a ton of reading and writing. Students read some pretty challenging texts from contemporary scholars, as well as older primary source material. They’re also asked to write. A lot. For many students, BHP provides a foundation of the skills they’ll need for the social studies courses they’ll take in subsequent years. The approach taken by BHP to develop student literacy skills is pretty straightforward. We have clear expectations and routines, all of which are introduced early and reinforced often. However, some teachers may find that they prefer using their own approaches. Great! Our aim isn’t to replace a strategy that’s working for you. We want to facilitate a conversation among teachers from around the world about different approaches to teaching literacy skills. This week, we’re going to focus our blog on some key questions about how the course helps students develop literacy skills, and also review the practices embedded in BHP that will help your students improve. We want to do more than just introduce the topic; we want to raise questions that even our veteran teachers will find interesting. We want to provide a brief overview of some of the basic assumptions we’ve made in the development of the BHP course, and highlight the tools available to you. The material below is far from comprehensive, but we hope it will serve as a quick overview for those new to the Big History Project. It’s as effective as it is simple – we’ve written all of our materials under the assumption that students will read each text multiple times. Each of the three readings focuses on a different aspect of the text. The first read is a quick preview to capture the gist of the article. The second read is more factual, focusing on the specific content covered in the reading. The final read is conceptual: We ask students to consider the reading through the lens of the lesson’s big questions. Although the three close reads process can seem tedious at first, the goal is for students to internalize the practice as a lifelong habit. Each article in this course is available at multiple reading levels. We want to ensure that students have access to the readings at a level appropriate for them so they can participate in class, regardless of their reading skills. The BHP course includes a ton of video. We’ve found that too often, students are passive rather than active viewers of text when it’s presented in video format. If we consider video as text, the same practice of three close reads proves helpful. We provide transcripts to help provide a preview of the video and annotate it along the way. We provide captions as secondary cues, and to help with your students’ factual “read,” we’ve also embedded questions at which you can pause the video. This year, BHP teamed up with our friends at Text Genome to provide an industry-leading set of tools for students. Much more than a mere list of definitions, our vocabulary represents critical concepts important to understanding the big ideas in the course. Each reading and video will include its own Text Genome report in which the essential vocabulary is listed. For each word, you’ll find related words (semantic network), forms of the same word (morphology), as well as several examples of the word used in context. We’ve also introduced new activities to help students really understand the vocabulary. You’ll use one writing rubric used throughout the entire course. Together with the repeated practice of claim testing, this gives students a simple and consistent approach to thinking about their writing, an approach that builds upon itself over the year. It’s introduced early in the year, and then students dive into details in the second half of the course. The BHP Writing Rubric is based on the practices identified in the C3 and the CCSS, as well as writing assessments students will see in the future, such as the SAT and AP exams. The BHP course includes an essay assignment—called an Investigation—in every unit. Modeled on the DBQ (document based question) assessments you might find in the SAT or other standardized tests, each Investigation asks students to review a series of texts, and then compose an evidence-based response. A key difference between DBQs and BHP Investigations is that the Investigations are scaffolded, which provides supports early on to help students develop habits for successful writing. The course includes a variety of student writing activities, both formal and informal. Repeated activities like the Driving Question Notebook provide opportunities for students to journal their thinking around the central question for each unit, capturing their assumptions early in the unit, based on prior knowledge, and then later on formalizing their understanding with evidence. The course also includes a variety of more formal activities aimed at developing student understanding of the BHP Writing Rubric, and strategies for improving their own writing. Each year, we work with the University of Michigan to conduct a study that looks at student writing progress over the duration of the course. We’ve shown that the very basic approach embedded in BHP has a real and significant impact on student learning. This year, for the first time, the Big History Project is introducing an essay-scoring service for schools called BHP Score. We’ve inferred from our ongoing research that one secret to continued improvement in student writing is increased feedback to students. Of course, teachers are already pressed for time and are grading as much student work as they possibly can. The BHP Score service provides a formative opportunity for teachers and students to get an external point of view on student essays. Teachers can then work with students to review the results and help them develop ideas about how to improve in subsequent drafts or future work.